Bouillabaisse was originally made by fishermen who used the bony rockfish which they were unable to sell to markets or restaurants. A traditional bouillabaisse contains at least three kinds of fish: red scorpionfish (Scorpaena scrofa), sea robin, and European conger. It can also include other fish as well as seafood such as shellfish, mussels, sea urchins, spider crab, velvet crabs, octopus. The ingredients may vary depending on what fish are available at the moment. 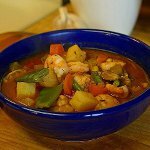 Bouillabaisse also includes vegetables such as onions, celery, leeks, tomatoes, and potatoes which are simmered together with the broth. The stew or soup is traditionally served with rouille, a sauce similar to mayonnaise made with egg yolk, olive oil, garlic, saffron, Cayenne pepper, and salt. The rouille sauce is usually spread onto toasted bread slices. As bouillabaisse is not easy to cook, we suggest that you celebrate the National Bouillabaisse Day by going to a Mediterranean restaurant and ordering a plate of this delicious fish soup.